Here’s a wonderful article on the debate about whether alternative medicine works and the view of it in mainstream medicine, alternative medicine, politics, science and from its detractors. What seems so hard to believe is that no form of research proves how efficacious alternative therapy is. All alternative practitioners see in their practice day in day out how people come in with both chronic and acute conditions and get significantly better in a relatively short period of time. All the clients who come for the treatments experience this too, otherwise they wouldn’t carry on coming back nor recommend it. The public are not fools. They want something that works and will pay for it if it does. So why is there no form of research that shows how remarkable alternative therapy is. In particular craniosacral therapy. If anyone has any experience around research and has any ideas how research could be created that would show how deeply it effects the body I would be very interested in helping bring together a research programme. In particular if anyone has any access to some of the new CT scanners that could measure the response in the body while being treated, that would be particularly exciting. Anyway here’s the article which runs to several pages. Click on the link at the end to continue on (thanks Jeanne for sending this on to me). The Center for Integrative Medicine, Berman’s clinic, is focused on alternative medicine, sometimes known as “complementary” or “holistic” medicine. 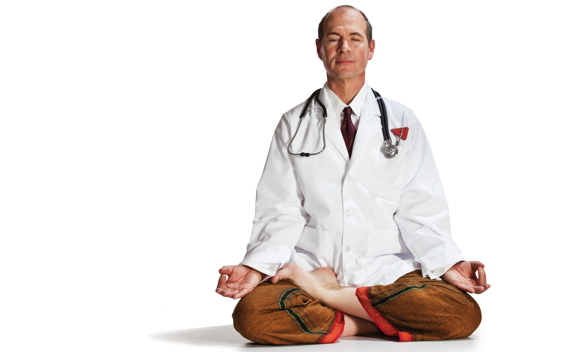 There’s no official list of what alternative medicine actually comprises, but treatments falling under the umbrella typically include acupuncture, homeopathy (the administration of a glass of water supposedly containing the undetectable remnants of various semi-toxic substances), chiropractic, herbal medicine, Reiki (“laying on of hands,” or “energy therapy”), meditation (now often called “mindfulness”), massage, aromatherapy, hypnosis, Ayurveda (a traditional medical practice originating in India), and several other treatments not normally prescribed by mainstream doctors. The term integrative medicinerefers to the conjunction of these practices with mainstream medical care. I hear you are in Toronto this weekend. Welcome to our city! I am a RCST/BCST practicing here who is very much interested bringing the research that does exist regarding Biodynamic Craniosacral to the surface. While I cannot offer CT scanners, I think a good place to start might be creating a database for RCST/BCST graduates to share the abstracts of their research projects. This is something I am hoping to compile and post on my website (www.cranialnerd.com) in the upcoming months. I think that there is a lot more research out there than we are aware of, it is just accessing that information that is the trick! I agree, employing proper research methods is essential for Craniosacral to gain recognition in the mainstream medical community as a valid therapy that produces positive results. In order to employ proper research, we will need a fair number of practitioners and participants to create control groups and (of course) funding. Any ideas? I have some experience conducting research and would also love to be involved in participating in a research program. If this project begins to unfold further, please let me know. Hi, I’m interested in getting more research out there on craniosacral therapy. I know someone at Warwick University is conducting a research study at the moment. I have offered my services at a pain clinic and was asked about using outcomes questionnaires. I am still waiting to hear if this is going ahead. Some info also from Westminster University about this I could send you, which recommends outcomes research if I remember rightly. Hi, This is slightly off topic but I have just this weekend been to a discussion on why evidence based practice is needed but is only slowly happening in massage – but this discussion would be just as valid for cst. As I understand it the bottom line is that the model that the west currently uses to test the relevance of a therapy is evidence based – rather than clinical based. These are quite different, which explains why anecdotal evidence and client reports of wellbeing get refuted and are considered inadequate as “proof”.The biomedical model frames its enquiry on factors that can be easily measured within the lab. (These are predominately visual e.g. x-rays / MRIs etc, performance based (ROMs) or chemical.) One would think massage could perform pretty well in this criteria, but the RCT (random controlled tests) are so rigorous, it is inevitably “proven” that massage is ineffective for any therapeutic outcome. However if we reframed the measurement tool to a biopsychosocial model, a far greater range and scope could be used. The problem though is that this is less valued by the medial fraternity and by it’s very design, admits to the variances that come when working with human “beings” as opposed to human machines. CST (even more than massage perhaps) is working with “stuff” outside of conventional medicine. I believe that many of the changes occuring within clients’ systems are out of the current range of measurement tools. Science is only just starting to understand / explain what many instinctively work with…and is many years away from measuring it. So – if we are to be taken seriously, the biopsychosoical model would seem our best bet for now. It uses a more holistic approach and while still limited in application, gives far more depth to the measurement of client response – and far more scope for research. It still has a component of “bio” so some medical tests can still be applied but looks at the whole person response. I think if I was investing time and $ in research – that is the model I would use for now. I agree Tish, I think much of what happens in a BCST session is very unique and individual to the person being treated on that particular day, making it difficult to standardise treatment as RCT need. I am a physiotherapist (originally from Oz) studying at CTET London at the moment. Physiotherapy as a profession has in recent years built up a better base of evidence based practise research by enlisting data collection from nation-wide or even international practitioners compiling results to build statistically significant sample groups. Insurance companies really want that these days to fund anything. We need to try and do the same with CST to start to show some evidence to support what we know works. When I have qualified I would love to be involved in some kind of research to help validate and promote the use of BCST. Personally I was incredibly aided following a dural tear with 3 sessions of BCST. Research needs to be broken into very specific measurable chunks, not big general questions. My aim in the future would be to start with something very specific like a longitudinal study of a patient group post dural tear. They could be their own controls with CST starting after say 6 months and symptoms monitored by a standardised questionnaire pre and post treatment. Very specific to the primary respiratory mechanism, of course BCST applies to the whole body but I think research like this, if shown to be efficacious would start to build awareness in the medical field. Before embarking on the hard road of research it is imperative to be talking to statisticians/uni research teams to ensure efforts are in the right direction from the get go. If the methodology / plan is not valid for any reason the quality of the research will not be high. Anecdotal evidence is poor, you need to show statistically significant numbers of improvement for x to show that a treatment is robust enough to be seen as ‘proven’. The way physiotherapy (for example) is building up more evidence is having a nation wide arrangement, where practitioners who volunteer to participate agree to submit data for say whiplash patients. They fill out and submit questionnaires / treatment information for patients relevant to the study group as they present, only a small amount of work for individual practitioners, but gaining a large input of sample size overall from lots of contributors.